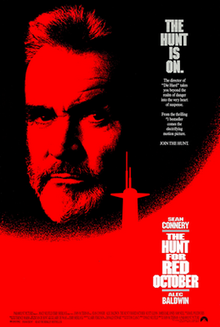 The Hunt for Red October is a 1990 American espionage submarine film produced by Mace Neufeld, directed by John McTiernan, that stars Sean Connery, Alec Baldwin, Scott Glenn, James Earl Jones, and Sam Neill. The film is a namesake based on Tom Clancy's 1984 bestselling eponymous novel. The story is set during the late Cold War era and involves a rogue Soviet naval captain who wishes to defect to the United States with his officers and the Soviet Navy's newest and most advanced nuclear missile submarine. An American CIA analyst correctly deduces his motive and must prove his theory to the U.S. Navy before a violent confrontation between the Soviet and the American navies spirals out of control. The film was a co-production between the motion picture studios Paramount Pictures, Mace Neufeld Productions, and Nina Saxon Film Design. Theatrically, it was commercially distributed by Paramount Pictures and by the Paramount Home Entertainment division for home media markets. Following its wide theatrical release, the film was nominated for and won a number of accolades. At the 63rd Academy Awards, the film was honored with the Academy Award for Best Sound Editing, along with nominations for Best Sound Mixing and Best Film Editing. On June 12, 1990, the original soundtrack, composed and conducted by Basil Poledouris, was released by MCA Records. The Hunt for Red October received mostly positive reviews from critics and was the 6th top-grossing film of the year, generating $122 million in North America and more than $200 million worldwide in box office business. The film was the first in a series involving the fictional character Jack Ryan, played additionally by Harrison Ford, Ben Affleck, Chris Pine, and John Krasinski. In November 1984, Soviet submarine captain Marko Ramius is given command of Red October, a new Typhoon-class nuclear missile submarine with a stealth "caterpillar drive", rendering it undetectable to passive sonar. Ramius leaves port to conduct exercises with attack submarine V. K. Konovalov, commanded by his former student Captain Tupolev. Once at sea, Ramius secretly kills political officer Ivan Putin and relays false orders that they are to conduct missile drills off America's east coast. At the same time, American attack submarine USS Dallas, tasked with identifying and shadowing Soviet subs as they leave port, detects Red October as it begins its mission, but immediately loses contact once the sub's caterpillar drive is engaged. The next morning, CIA analyst and former Marine, Jack Ryan, after consulting with Vice Admiral James Greer, briefs government officials on Red October and the threat it poses. The U.S. fears Ramius plans a renegade nuclear strike. They also learn that the bulk of the Soviet Navy has been deployed to the Atlantic to find and sink the sub. During the briefing, Ryan hypothesizes that Ramius instead plans to defect, and NSC chairman Jeffrey Pelt gives Ryan three days to confirm his theory. Meanwhile, Tupolev, though unable to track Red October, guesses his former mentor's route and sets a course to intercept. Due to the actions of an unknown saboteur, Red October's caterpillar drive malfunctions during risky maneuvers through a narrow undersea canyon. Petty Officer Jones, a sonar technician aboard Dallas, has discovered a way to detect Red October using his underwater acoustics software, and Dallas plots their own intercept course. Ryan arranges a hazardous mid-ocean rendezvous to board Dallas, where he attempts to persuade its captain, Commander Bart Mancuso, to contact Ramius and determine his intentions. The Soviet ambassador informs the U.S. government that Ramius is a renegade, and asks for help in sinking Red October. That order is sent to the U.S. fleet, including Dallas, which has found the Soviet sub. Ryan, however, is convinced that Ramius plans to defect with his officers and convinces Mancuso to contact Ramius and offer assistance. Ramius, stunned that the Americans correctly guessed his plan, accepts. He then stages a nuclear reactor "emergency", ordering his crew to abandon ship. After a U.S. frigate is spotted, Ramius submerges. Meanwhile, Ryan, Mancuso, and Jones come aboard via a rescue sub, at which point Ramius requests asylum for himself and his officers. Red October is suddenly attacked by V. K. Konovalov, which has tracked them across the Atlantic. As the two Soviet subs maneuver, one of Red October's cooks, Loginov, an undercover KGB agent and the secret saboteur, opens fire on the bridge, fatally wounding first officer Vasily Borodin before retreating to the nuclear missile bay. Ryan and Ramius pursue him, and Loginov wounds Ramius in the shoulder, but Ryan kills Loginov before he can detonate a missile. Meanwhile, Red October makes evasive maneuvers with a diversion provided by Dallas, causing V. K. Konovalov to be destroyed by its own fired torpedo. The crew of Red October, now rescued, watch the explosion from the deck of the U.S. frigate; unaware of the second Soviet submarine, they believe that Ramius has sacrificed himself and scuttled Red October to avoid being boarded. Ryan and Ramius, their subterfuge complete, navigate Red October to the Penobscot River in Maine. Ramius admits that the reason he defected was that after he was handed the plans for Red October, a nuclear war first strike weapon, he concluded that he could never support such an action. From atop the submarine's sail deck, Ramius, pleased to have made it to America, offers Ryan a quote from Christopher Columbus. Ryan nods in agreement and offers in return, "Welcome to the New World, sir". Producer Mace Neufeld optioned Tom Clancy's novel after reading galley proofs in February 1985. Despite the book becoming a best seller, no Hollywood studio was interested because of its content. Neufeld said, "I read some of the reports from the other studios, and the story was too complicated to understand". After a year and a half he finally got a high-level executive at Paramount Pictures to read Clancy's novel and agree to develop it into a film. Screenwriters Larry Ferguson and Donald Stewart worked on the screenplay while Neufeld approached the U.S. Navy for approval. They feared top secret information or technology might be revealed. However, several admirals liked Clancy's book and reasoned that the film could do for submariners what Top Gun did for the Navy's jet fighter pilots. Captain Michael Sherman, director of the Navy's western regional information office in Los Angeles, suggested changes to the script that would present the Navy in a positive light. The Navy gave the filmmakers access to several Los Angeles-class submarines, allowing them to photograph unclassified sections of both Chicago and Portsmouth to use in set and prop design. Louisville was used for the scene in which Baldwin is dropped from a helicopter to the submarine. Key cast and crew members rode along in subs, including Alec Baldwin and Scott Glenn, who took an overnight trip aboard the Salt Lake City commanded by then Commander Thomas B. Fargo. Glenn based his portrayal of Commander Bart Mancuso on Fargo. The film is a nearly faithful adaptation of Clancy's novel, even though there are many deviations, including Red October traveling up the Penobscot River in Maine to dry dock, the omission of the Royal Navy task force including Ryan's time aboard HMS Invincible, and the "caterpillar drive" being described in the film as a magnetohydrodynamic drive system, essentially, "a jet engine for the water", rather than a means of disguising the sound created by the screws as Clancy originally wrote. Some of the principal cast had previous military service which they drew on for their roles. Sean Connery had served in the Royal Navy, Scott Glenn in the United States Marine Corps and James Earl Jones in the United States Army. Baldwin and Glenn spent time on a Los Angeles-class submarine. Baldwin was trained to drive an attack submarine. Some extras portraying the Dallas crew were serving submariners, including the pilot of the DSRV, Lt Cmdr George Billy, commander of the DSRV. Submariners from San Diego were cast as extras because it was easier to hire them than to train actors. Crew from USS La Jolla, including Lt Mark Draxton, took leave to participate in filming. According to an article in Sea Classics, at least two sailors from the Atlantic Fleet-based Dallas took leave and participated in the Pacific Fleet-supported filming. The crew of Houston called their month-long filming schedule the "Hunt for Red Ops." Houston made more than 40 emergency surfacing "blows" for rehearsal and for the cameras. Baldwin was approached in December 1988, but was not told for what role. Klaus Maria Brandauer was cast as Soviet sub commander Marko Ramius but two weeks into filming he quit due to a prior commitment. The producers faxed the script to Sean Connery who, at first, declined because the script seemed implausible in portraying the Soviet Union as an ambitious naval power. He was missing the first page which set the story before Gorbachev's coming to power, when the events of the book would have seemed more plausible. He arrived in L.A. on a Friday and was supposed to start filming on Monday but he requested a day to rehearse. Principal photography began on April 3, 1989 with a $30 million budget. The Navy lent the film crew Houston, Enterprise, two frigates (Wadsworth and Reuben James), helicopters, and a dry-dock crew. Filmmaker John Milius revised some of the film's script, writing a few speeches for Sean Connery and all of his Russian dialogue. [dead link] He was asked to rewrite the whole film but was only required to do the Russian sequences. Rather than choosing between the realism of Russian dialog with subtitles, or the audience-friendly use of English (with or without Russian accents), the filmmakers compromised with a deliberate conceit. The film begins with the actors speaking Russian with English subtitles. But in an early scene, actor Peter Firth casually switches in mid-sentence to speaking in English on the word "Armageddon", which is the same spoken word in both languages. After that point, all the Soviets' dialogue is communicated in English. Connery continued using the Russian accent for the rest of the motion picture. Only towards the end of the film, at the beginning of the scene in which the Soviet and American submariners meet, do some of the actors speak in Russian again. Filming in submarines was impractical. Instead, five soundstages on the Paramount backlot were used. Two 50-square-foot (4.6 m2) platforms housing mock-ups of Red October and Dallas were built, standing on hydraulic gimbals that simulated the sub's movements. Connery recalled, "It was very claustrophobic. There were 62 people in a very confined space, 45 feet above the stage floor. It got very hot on the sets, and I'm also prone to sea sickness. The set would tilt to 45 degrees. Very disturbing." The veteran actor shot for four weeks and the rest of the production shot for additional months on location in Port Angeles, Washington and the waters off Los Angeles. Made before sophisticated CGI became the norm in filmmaking, the film's opening sequence featured a long pull-out reveal of the immense titular Typhoon-class sub. It included a nearly full-scale, above-the-water-line mockup of the sub, constructed from two barges welded together. Each country's submarine had its own background color: Soviet submarines, such as Red October and V.K. Konovalov, had interiors in black with silver trim. American ships, such as Dallas and Enterprise, had grey interiors. However, during one scene when Dallas goes to a higher alert status it was flooded with red light. 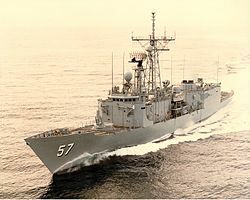 Early filming was aboard USS Reuben James in the area of the Juan de Fuca Strait and Puget Sound in March 1989. The ship operated out of U.S. Coast Guard Station Port Angeles. The SH-60B detachment from the Battlecats of HSL-43 operated out of NAS Whidbey Island, after being displaced by the filmcrew. Most underwater scenes were filmed using smoke with a model sub connected to 12 cables, giving precise, smooth control for turns. Computer effects, in their infancy, created bubbles and other effects such as particulates in the water. By March 1990, just before the film's theatrical release, the Soviet Parliament removed the Communist Party from government, effectively ending the Cold War. Set during this period, there were concerns that with its end, the film would be irrelevant but Neufeld felt that it "never really represented a major problem". To compensate for the change in the Soviet Union's political climate, an on-screen crawl appears at the beginning of the film stating that it takes place in 1984 during the Cold War. Tony Seiniger designed the film's poster and drew inspiration from Soviet poster art, utilizing bold red, white and black graphics. According to him, the whole ad campaign was designed to have a "techno-suspense quality to it". The idea was to play up the thriller aspects and downplay the political elements. The film caused a minor sensation in the black projects submarine warfare technology community. In one scene, where USS Dallas is chasing Red October through the submarine canyon, the crew can be heard calling out that they have various "milligal anomalies". This essentially revealed the use of gravimetry as a method of silent navigation in US submarines. Thought to be a billion dollar black project, the development of a full-tensor gravity gradiometer by Bell Aerospace was a classified technology at the time. It was thought to be deployed on only a few Ohio-class submarines after it was first developed in 1973. Bell Aerospace later sold the technology to Bell Geospace for oil exploration purposes. The last Typhoon-class submarine was officially laid down in 1986, under the name TK-210, but according to sources was never finished and scrapped in 1990. The musical score of The Hunt for Red October was composed and conducted by Basil Poledouris. A soundtrack album composed of ten melodies was released on June 12, 1990. The album is missing some of the musical moments present in the film, including the scene where the crew of Red October sings the Soviet national hymn. The soundtrack is limited due to the fact that it was originally compiled to fit the Compact Cassette. Later, it was remastered for the CD. An expanded version was released in late 2013 by Intrada Records. It features 40 additional minutes of the score, including the until then unreleased end titles. The Hunt for Red October opened in 1,225 theaters on March 2, 1990, grossing $17 million on its opening weekend, more than half its budget. The film opened at number one at the U.S. box office and remained there for three weeks. Its opening was the 20th biggest weekend of all time and the biggest non-summer, non-Thanksgiving weekend to date. The film went on to gross $122,012,643 in North America with a worldwide total of $200,512,643. As of December 2018[update], the film held an 88% rating at the review aggregator website Rotten Tomatoes, based on 69 critics. At Metacritic, which assigns a weighted average out of 100 to critics' reviews, The Hunt for Red October received a score of 58 based on 17 reviews. Audiences polled by CinemaScore gave the film an average grade of "A" on an A+ to F scale. Roger Ebert called the film "a skillful, efficient film that involves us in the clever and deceptive game being played", while Gene Siskel commented on the film's technical achievement and Baldwin's convincing portrayal of Jack Ryan. Nick Schager, for Slant magazine's review, noted, "The Hunt for Red October is a thrilling edge-of-your-seat trifle that has admirably withstood the test of time". In contrast, Newsweek's David Ansen wrote, "But it's at the gut level that Red October disappoints. This smoother, impressively mounted machine is curiously ungripping. Like an overfilled kettle, it takes far too long to come to a boil". Vincent Canby, writing for The New York Times, opined that "the characters, like the lethal hardware, are simply functions of the plot, which in this case seems to be a lot more complex than it really is". The Hunt for Red October was nominated and won several awards in 1991. In addition, the film was also nominated for AFI's 100 Years...100 Thrills. ^ "The Huntsman for Red October (PG)". British Board of Film Classification. March 15, 1990. Retrieved September 4, 2016. ^ "The Hunt for Red October". Box Office Mojo. Retrieved December 3, 2007. ^ a b c d e Thomas, Bob (March 2, 1990). "High-Tech Novel Took Five Years to Reach Screen". Associated Press. ^ a b c Donohue, Cathryn (March 2, 1990). "Red October Surfaces as a Movie". The Washington Times. ^ Scott, Walter. "5 Things You Didn't Know About Alec Baldwin". Parade. Retrieved February 11, 2017. ^ Thomas, Bob. "Submarine thriller surfaces with Connery in command". Lawrence Journal-World. Associated Press. Retrieved April 30, 2016. ^ a b c Kilday, Gregg (March 2, 1990). "Reds Sail Into the Sunset". Entertainment Weekly. Retrieved May 20, 2010. ^ Plume, Ken (May 7, 2003). "An Interview with John Milius". IGN. Retrieved May 20, 2010. ^ "Hunt for Red October Article" (PDF). 53. CIA. Summer 2009. p. 24. Retrieved July 14, 2010. ^ "Gravity Gradiometry Article". Scientific American. June 1998. Archived from the original on June 10, 2011. Retrieved July 14, 2010. ^ "Bell gradiometer history". BellGeospace. Archived from the original on December 12, 2009. Retrieved July 14, 2010. ^ McDonald, Steven. "The Hunt for Red October [Original Motion Picture Soundtrack] – Overview". AllMusic. All Media Network, LLC. Retrieved February 2, 2014. ^ "Hunt for Red October, The". Intrada Records. Retrieved February 14, 2014. ^ a b "The Hunt for Red October". Box Office Mojo. Retrieved December 3, 2007. ^ "'Hunt' turns up b.o. records in bow; best non-Thanksgiving, non-summer debut". Variety. March 7, 1990. p. 8. ^ "The Hunt for Red October". Metacritic. Retrieved January 17, 2014. ^ Ebert, Roger (March 2, 1990). "The Hunt for Red October". Chicago Sun-Times. Retrieved October 25, 2007. ^ Schaer, Nick (2003). "The Hunt for Red October". Slant Magazine. Archived from the original on October 24, 2007. Retrieved October 5, 2018. ^ Ansen, David (March 2, 1990). "The Hunt for Red October". Newsweek. ^ "Reviews/Film; Connery as Captain of a Renegade Soviet Sub". The New York Times. Retrieved January 17, 2014. ^ "The 63rd Academy Awards (1991) Nominees and Winners". oscars.org. Retrieved October 20, 2011. "The Hunt for Red October". Paramount Pictures – via YouTube.